This page is to help those who need any information on me and my current works. The button below will take you to the downloadable .pdf and .doc versions of this press kit. I hope it helps you. For business queries or novel rights, please contact Chaffin Press at chaffinpress@gmail.com. E.N. Chaffin is an American author born and raised on country cooking and Japanese anime. 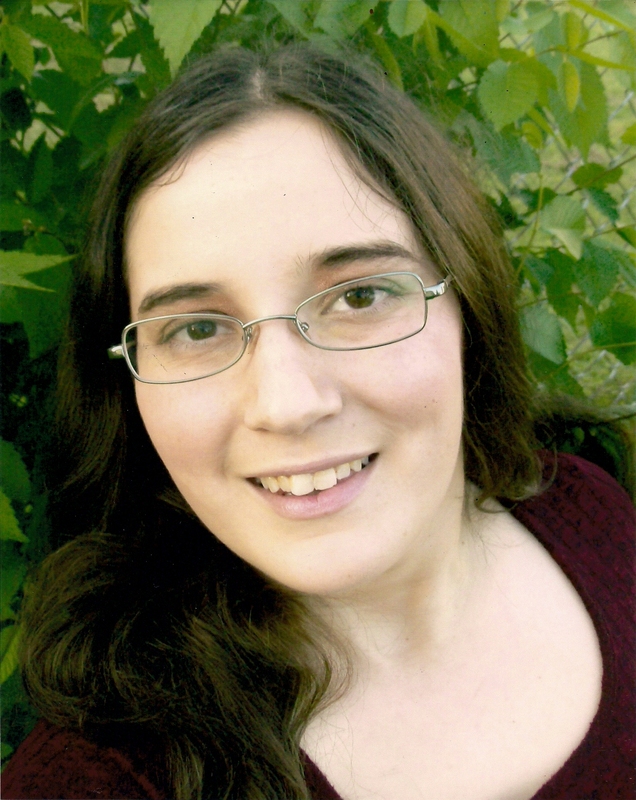 She intends to write stories about her passions that will upset the YA fiction world and change it for the weirder, even if she inhabits a small room in Northwest Arkansas with her three dogs. E.N. Chaffin is an American author, born and raised on country cooking and Japanese anime. Aside from drowning herself in reading manga and sewing cosplay, she also enjoys saving mythical worlds on her outdated gaming systems. Being drained of the love for teaching theatre, Chaffin has rekindled her dream of becoming a bestselling author. 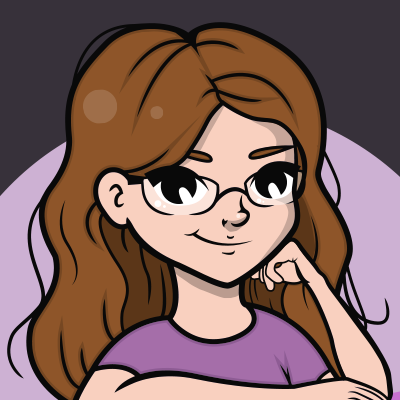 She intends to draw on her passions and hobbies to write stories that will upset the YA fiction world and change it for the weirder. She currently inhabits a small room in her family’s house in Northwest Arkansas with her three dogs, Kahn, Scooter, and Annie. When a no-powers thug and a straight-A student get caught in between a drug-dealing gang and an evil corporation kidnapping teenagers, anything can happen. Especially when their teacher starts harping on them to finish their history project. Everyone in Devi Omega has a special ability. Everyone except Hero Leander, the official troublemaker of Class 1B. His life couldn’t get any worse until he is forced to be project partners with Annie Mei Fields. She is not only a straight-A student and the top Charisma-user of the school, but she is determined to make him do his part of the work. The story takes place within a video game world. The book is on the older side of young adult literature. There are two main characters, Hero Leander and Annie Mei Fields. The story is influenced by Japanese anime, multiple video games and other pieces of literature, such as Jane Austin’s Pride and Prejudice. There are many anagrams, puns and hidden secrets within the book for readers to find. First three chapters are free to read online. Get first six when you subscribe to enchaffin.com. Annie ran towards the car. Beneath her, the ground came punching up, trying to grab her. She hopped from one shooting pillar to another, finally getting back down to solid ground. She kept running towards the car, watching two men step out. One ran towards her, stamina bar glowing bright red. He shot his hand out and grabbed her wrist, sending an electrical current through her body. She screamed and ripped away from him. She ran off as fast as she could. The men ran after her. Thinking happy thoughts, she let out pink smoke from her hands, as much as she could. The men were caught in it, coughing before roaring into laughter. She ran up a slide and launched herself over a fence. She rolled down a hill, before springing up and running as fast as her feet could take her, blinking away salty tears. I try more to stay original than anything else. I want my writing to have its own voice and to surprise the readers. If I stuck to what readers always wanted, then I would not be bringing them anything new or different. Why did you decide to self-publish instead of traditionally publish? I knew it would take me a while to find a literary agent that’s right for me. It would take even more time to find a publishing company that would take a chance on my book. I didn’t want to wait for a maybe. I self-published to have the readers decide if my work was good enough to be published since they were the ones I am writing for. I don’t want to make my male characters stereotypical. Even if they are inspired by a stereotype, I want to write a real boy, teenager, or man. I have had to dig deep, study men in everyday life, and figure out what and how they think. It’s more than just sports and women. And I hope more female writers would do this, instead of just putting a buff hottie or a giant nerd in their stories. It’s just as bad as when male writers put swooning teenage girls or queen bees in their stories. I have so many ideas for novels to come that I always try to develop. But the ones I’ve started writing on are two separate series. One is more high fantasy, while the other, which will start coming out in the first half of 2018, is a modern fantasy with vampires, witches and more. Can I give up my cashiering skills? In all honesty, though, everything that I have and have gone through makes me the writer I am. The only thing that’ll make me a better writer is working on my craft. Though sometimes trading a few discipline skills for writing skills does seem appealing. Do your family and friends support your career as a writer? My family does. My mom and dad know I love writing. They tell me that if it’s what God and I want for my life, it’ll happen. I just have to work hard. With my friends, it depends. Many of them don’t know how to feel, but they tell me if I want to do it, I should go for it. Others don’t think I can. But that might be from thinking of famous authors and where they are now. I think they forget that anyone famous has to start somewhere. Finding the time to write. Between working full-time overnight and finding time for family and friends – you know, being social – I have to force myself to work on my stories sometimes. It’s hard to do, but it’s worth it. When I was struggling to finish the first draft, I searched for a book to help me. I found The Fantasy Fiction Formula by Deborah Chester. Chester is a brilliant teacher. She taught me so much about structure and how a story should flow to make it more enjoyable for the reader. After reading her book, I scrapped my original draft and worked on the story from a different angle. It really did help. A writer can be born with the talent to write. But if they don’t exercise that talent and always strive to better themselves, they won’t accomplish anything. Writers can be born, but only the best work for it. It seems most young adults today are more focused on YouTube, movies, and other media. What would you do to make them interested in reading? By writing about something they care about. This is why my first book, Loading Life, is based on video game and anime worlds. I want those gamers and nerds to know that reading can be fun, and sometimes it is good to step away from the screen and pick up a book – even if it is an eBook. I’ve always loved writing stories when I was younger, and have had the dream of being a famous author. I pushed it aside, though, and decided to focus on school. It wasn’t until I finished my Master’s that I realized my real passion was writing stories to teach youth, not being in front of a classroom. Research and practice. You don’t know everything about your craft or your story. And never assume you do. That’s how pride gets in the way of making your story better. I am always writing short stories for my blog, to keep my readers entertained. I am also writing my next book, the first in my modern fantasy series. Are you going to keep your full-time job and only write part-time, or do you see yourself becoming a full-time writer? I plan on being a full-time writer. That’s my dream job and my goal. But I’ll need to support myself with my writing before I can go to it full time. When that happens, though, you bet I’ll be blasting it all over my social media. How long did it take you to write Loading Life? It took me about six months for the actual writing process. I went through five drafts and countless hours of editing before coming out with the final version. There are a few scenes that are very . . . emotional to say the least. I wanted to get them right; to hit the readers right where it hurts in the best and most effective way possible. I found myself crying when I finished writing them. If my readers cry too, then I know I’ve done my job right. I’ve always loved watching anime and playing video games. One day, while writing in my high fantasy series, I just thought, what would it be like to live in a video game? Not just go into one, but actually live in one. 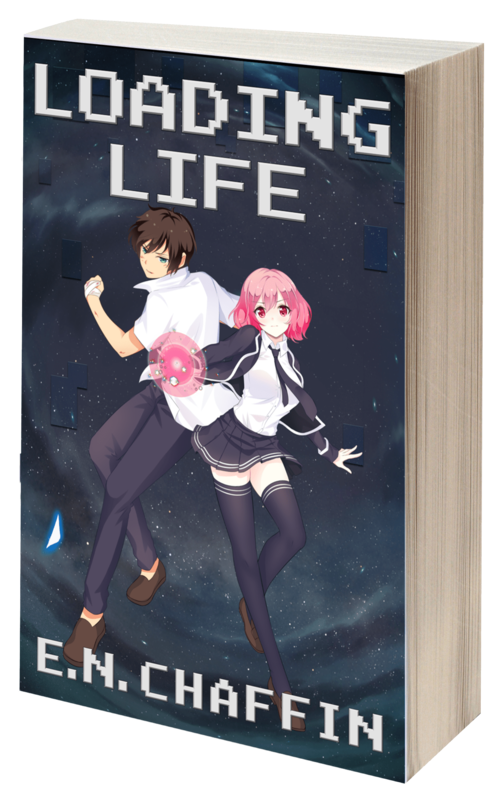 So, I put my series aside and began working on Loading Life. I’ve read many young adult books surrounding the topic of anime fans, but none on actual anime – besides those in the comic industry, that is. I find that my book brings this aspect to the YA world. It may be something many readers may not have encountered yet, but I hope they get into by reading my novel. I’m not quite sure about the lead roles. But I do know that I want it to be animated, instead of live-action. Possibly in the CLAMP style or the way Kohei Horikoshi designed his series My Hero Academia. I wanted to play with the video game aspects of my book since I knew I wanted the cover to be animated. 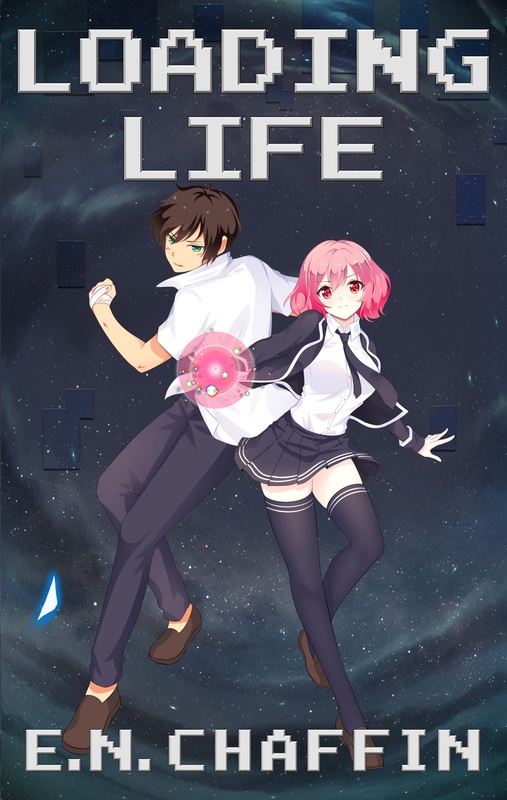 I came up with Loading Life after my computer took forever to reboot from an update. It may have also been due to me banging my head on my desk when said update and reboot were in progress. Even if life itself seems to be against you and your dreams, never give up. Remind yourself of why you want to reach your dreams and keep working towards them. Your typical school thug and top-student being forced to work on a history project in between escaping a vicious gang and stopping an evil corporation from kidnapping kids for their special abilities. What were some of the challenges of writing your first book? The first was teaching myself how to write a good story that could span an entire novel. The second was sticking with the project in order to finish it. Some of the other challenges have come from learning how to prepare my book for publishing and reaching new readers. I might spend time with Reut, the main character’s best friend. I could see us going to the bookstore, eating at a fast food restaurant, and just walking around in the park. I might force him to go into Hobby Lobby while I look at potential cosplay material. Visit http://www.enchaffin.com/nectere to read a new short story every two weeks! Visit my youtube channel to watch a new writer’s video every week.